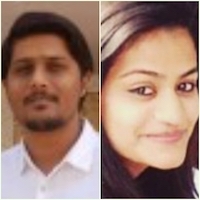 In fact, the NaMo app was created by Silver Touch Technologies – a company that has connections to the same Facebook page. Last month, a detailed investigative report by journalist Samarth Bansal made a discomforting revelation about India’s growing fake news problem and its direct link with the government. That the discovery was made during an election year makes it even more important and deserving of our attention. Bansal showed how misinformation thrives on Prime Minister Narendra Modi’s personal mobile application, NaMo App, which provides a built-in Twitter-esque network to its millions of users. However, unlike scrutiny of misinformation on other social media platforms, the content on Namo App stays off the radar. Misuse of social media for political one-upmanship isn’t a new phenomenon in this country. But the issue becomes even more problematic when the prime minister’s personal app promotes accounts infamous for sharing misinformation. The ‘My Network’ section of NaMo App houses 15 promoted and verified accounts, found Bansal. Among these is ‘The India Eye‘. But here’s where the story gets interesting – users don’t enjoy the discretion to not see the content posted by this account (or by any other promoted account). Even if one chooses to unfollow The India Eye,its posts still appear on their ‘My Network’ feed. In the aftermath of the opposition’s Mahagathbandhan rally, this account attempted to portray Delhi chief minister Arvind Kejriwal as more concerned about Pakistan than about India. “Pakistan will suffer if Modi comes into power” – this quote was ascribed to CM Kejriwal while The India Eye termed him “anti-national”. The part where CM Kejriwal says “this country”, was changed to “Pakistan”. The above example is one among a plethora of misleading posts circulated by The India Eye. The India Eye isn’t merely a propaganda account on NaMo App. Its activities are widespread in the online world, including a Twitter account, a Facebook page, and websites. In September last year, Alt News had chronicled its trysts with misinformation on social media. During the course of our investigation, we found connections between a Gujarat-based company Silver Touch Technologies and The India Eye. Alt News followed the social media activities of a Twitter handle @HemanNamo, which promoted The India Eye during its initial days, and discovered that the individual managing the handle was associated with The India Eye website. 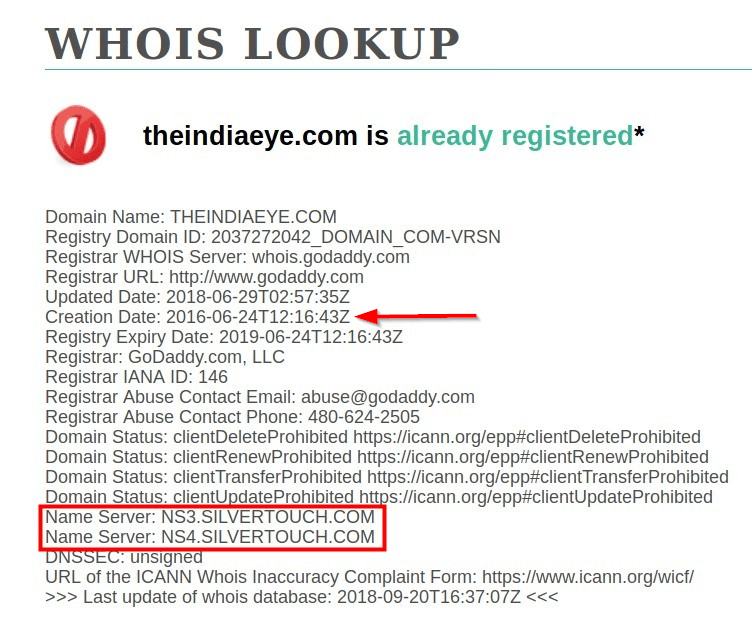 @HemanNamoor, or Himanshu Jain, is the director of Silver Touch Technologies, and theindiaeye.in was registered under his name and phone number. Furthermore, we also found that his company’s servers were used to host theindiaeye.com. However, right after our conversation with Himanshu Jain, questioning him about the apparent connection, the IP addresses of theindiaeye.com were changed. When we reached out to the managing director of Silver Touch, Vipul Thakkar, he said that his company isn’t associated with The India Eye. Silver Touch Technologies is an IT firm that was established in Ahmedabad in 1992 and one of its work is providing IT solutions for e-governance. As part of this business wing, the company has developed various projects for the BJP government. 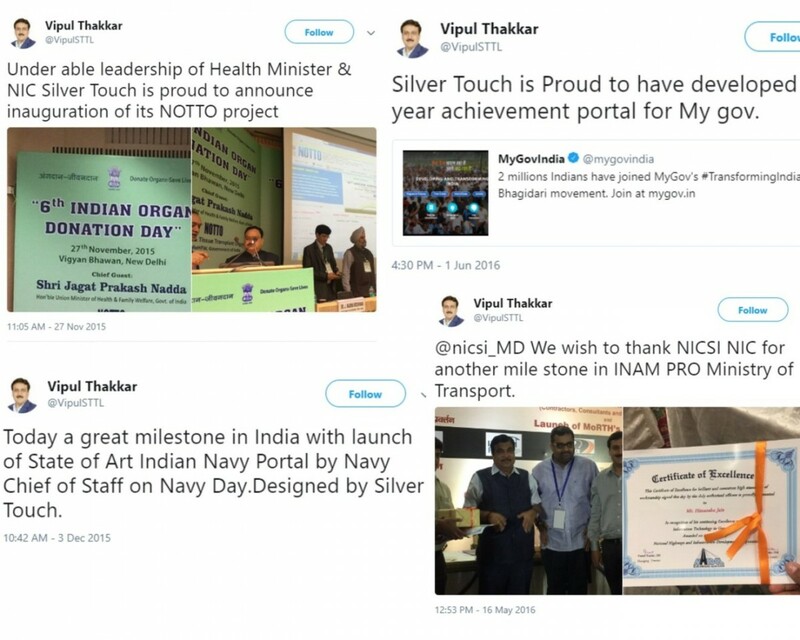 MD Vipul Thakkar had tweeted about some of these projects. But the focus of this article is one specific project – the NaMo App – which was also developed by Silver Touch. “The mobile app developed by Silver Touch, offers the latest news and updates about the PM. It gives access to PM’s ‘Mann Ki Baat’ state addresses, his biography and blogs. The app will also update people of PM’s Governance initiatives, achievements and development related Infographics. The Android app will allow users to contribute and earn badges through to-do tasks,” the company described the app in a blog post. The connection is apparent. In fact, the association of Himanshu Jain and his company Silver Touch with The India Eye was also disclosed by NDTV in 2017. The news channel had also found that 53% of the company’s work came from government contracts worth approximately Rs 62.5 crore. Furthermore, Himanshu Jain, from his Twitter account @HemanNamo, was a part of trending pro-BJP hashtags. He is also followed by prime minister Narendra Modi on Twitter. Digging out similar information now would be a futile attempt. Most of the details laid out by Alt News have been taken down by both Himanshu Jain and Silver Touch. In fact, Jain has also changed his Twitter handle from @HemanNamo to @NamoNews2019. But our earlier investigation includes all the necessary links of association that can be accessed here. 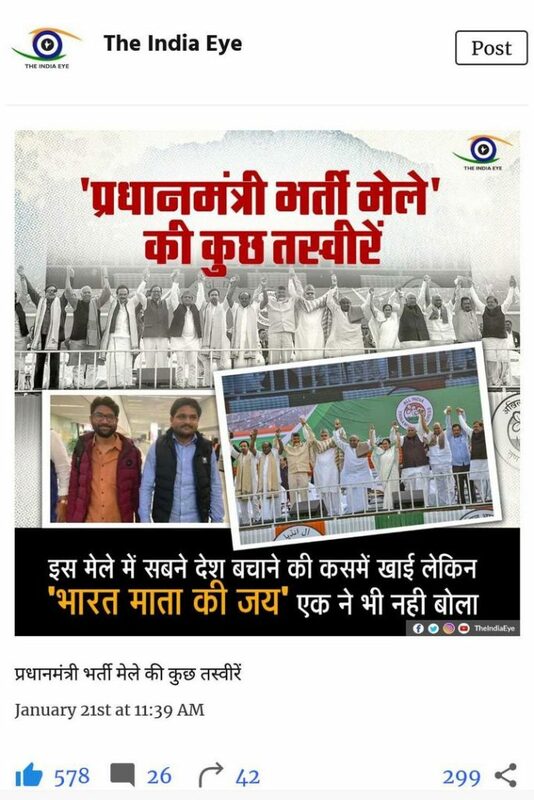 On January 21, the account posted images of mahagatbandhan rally in Kolkata, claiming that everyone present at the rally took an oath to save the country but nobody said, “Bharat mata ki jai”. BJP president Amit Shah also made a similar claim while addressing a rally in Malda, West Bengal. Alt News found that the claim was untrue. Patidar agitation leader Hardik Patel while ending his speech at the rally had raised slogans of ‘Jai Hind’ and ‘Bharat mata ki jai’. 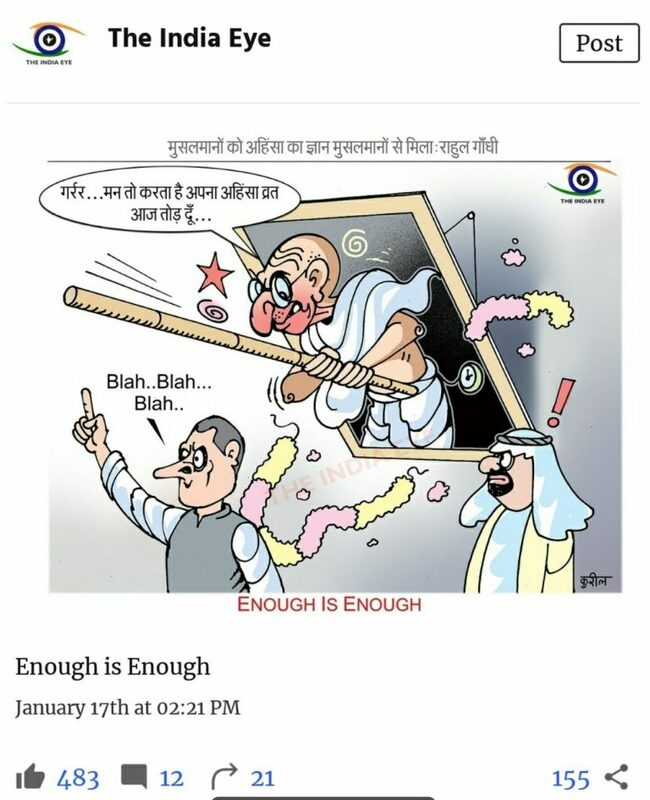 A cartoon posted by The India Eye attributed a statement to Rahul Gandhi which said, “मुसलमानो को अहिंसा का ज्ञान मुसलमानो से मिला (Muslims got the philosophy of non-violence from Muslims/Islam-translated)”. The statement ascribed to the Congress president was based on clipped video. Rahul Gandhi, in his speech at Dubai said, that non-violence was inspired by every great religion of the world, including ancient Indian religions, Christianity and Judaism. He did not single out Islam as suggested in the cartoon. 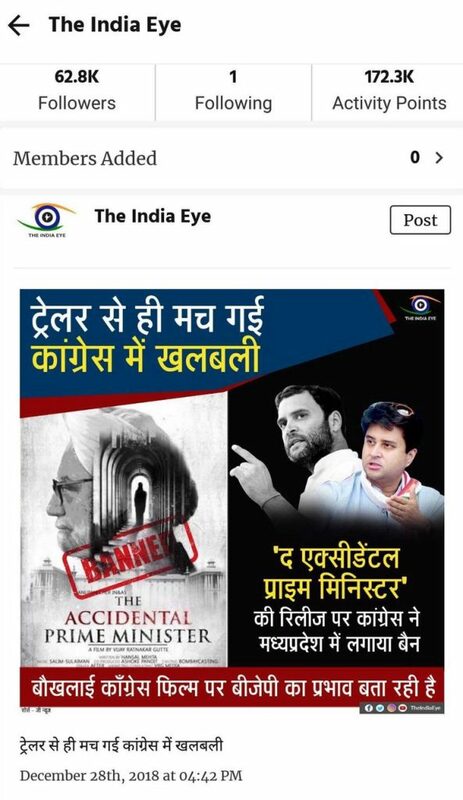 Another post by The India Eye said, “Congress bans the release of The Accidental Prime Minister in Madhya Pradesh”. The claim was based on reports by several media outlets which later turned out to be false. The official Twitter handle of the department of public relations of the Madhya Pradesh government clarified that there was no decision to ban the film. 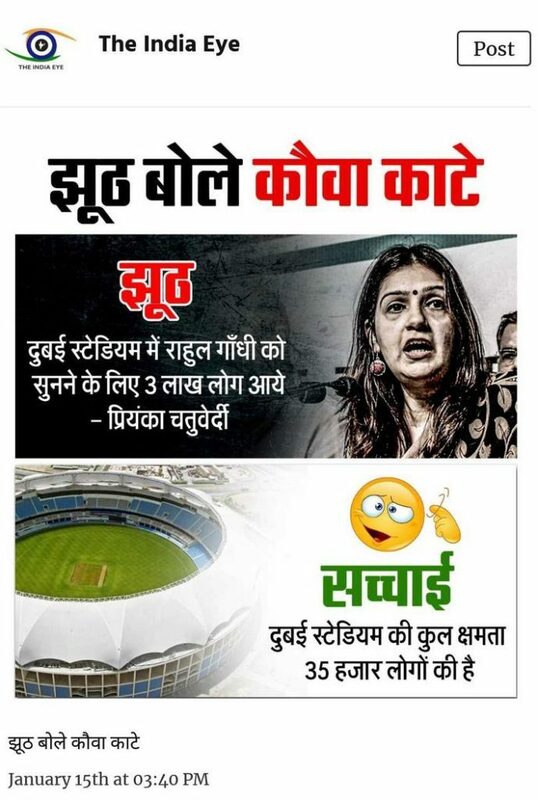 “दुबई स्टेडियम में राहुल गाँधी को सुनने ३ लाख लोग आये (Three lakh people came to listen to Rahul Gandhi at the Dubai stadium-translated)”, read a quote attributed to Congress spokesperson Priyanka Chaturvedi. The post claimed that Chaturvedi’s statement is false. Gaurav Pradhan also made an identical claim. However, we found that Chaturvedi never made such a statement. She quote-tweeted Pradhan’s tweet and rubbished the claim. अपने छोटी सोच और दिमाग़ का परिचय मेरे नाम से जोड़कर देश को प्रस्तुत करने का काम ना करें! The evidence at hand shows that prime minister Narendra Modi’s personal mobile application NaMo App was created by a company that has connections to Facebook page The India Eye. Despite the page’s established track record of promoting misinformation, the content from the same outlet is included among the 15 promoted accounts in NaMo App. Moreover, every user sees its posts by default even after unfollowing the outlet. That the NaMo App has such scant regard for the veracity of the information shared on its ‘My Network’ section to millions of users shows how the country’s ruling party has a massive fake news problem. This article was first published on Alt News. Read the original here.